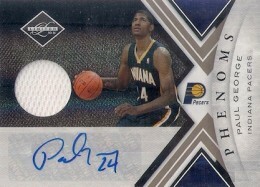 While not yet a household name, Paul George and his rookie cards are starting to gain the attention of the masses. After a few seasons with the Indiana Pacers, Paul George has firmly planted himself in the starting lineup and his strong play has helped his team become a perennial playoff team. 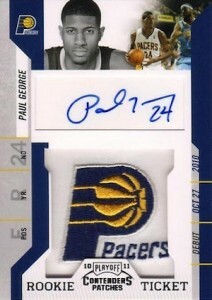 Shop for Paul George cards on eBay. The man with two first names, Paul George played for Fresno State for two years before he was selected 10th overall by the Pacers in the 2010 NBA Draft. George was named to the All-Rookie 2nd Team while primarily coming off the bench. He got his shot as a starter during his Sophomore season and averaged over 12 points, two assists and five rebounds per game during the lockout-shortened season. Paul George's breakout year came during the 2012-13 season. Posting career highs, George averaged over 17 points, four assists and seven rebounds per game. He was also named to his first All-Star team and helped the Pacers lock up the third playoff seed in the Eastern Conference. While the Pacers are not quite ready to compete with the Miami Heat in the Eastern Conference, a few good individual performances in the playoffs will greatly enhance Paul George's value. Indiana is not an ideal market for a young star but the Pacers have surrounded George with several talented players and they appear to be stocked for many years of playoff runs. 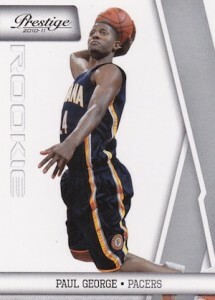 As with most things in the hobby, individual accolades, consistent winning and NBA Championships will dictate long-term value, but at current prices, Paul George rookie cards are a worthwhile risk. 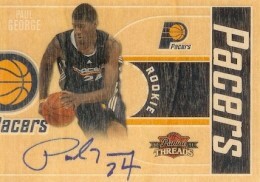 The following list shows all 17 Paul George rookie cards, including 13 autographed cards. 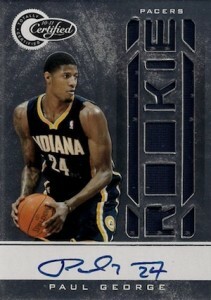 All of the official NBA licensed Paul George rookie cards are found in Panini products. Collectors hoping to expand their Paul George collections to autographed memorabilia are not left with many options. There are still plenty of choices among his cards, and as his reputation builds, more collecting avenues will emerge for Paul George. The Absolute Memorabilia Paul George rookie card is dominated by a three-piece relic that features two small jersey swatches and one basketball piece, and a sticker autograph. 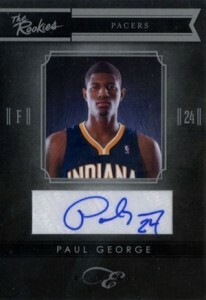 With a print run of 499, it is one of the most plentiful autographed Paul George rookie cards. Part of the low-end offerings geared toward kids and new collectors, Adrenalyn XL is actually a game, as well as a collectible. Although a print run of 449 hinders the value some, the Paul George rookie card from Classics is a great value option for collectors. 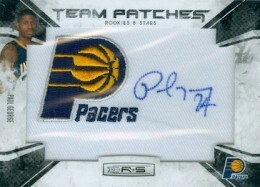 Featuring an on-card autograph with ample singing space, the card utilizes an appealing design that incorporates the Pacers color scheme. While the card is not plain, the design allows the image of George to be the featured element. 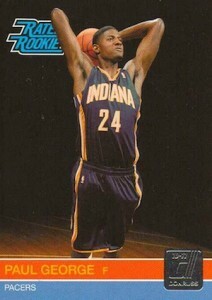 A great throwback to the past, the Rated Rookie card of Paul George is another low-end option for collectors to pursue. Featuring the simplest design and some great photography, Panini should make this a regular in their yearly products. Elite Black Box received mixed reviews from collectors. Like the Paul George rookie card, many incorporated sticker autographs and the all black color scheme was prone to chipping and smudges. Still, with only 149 cards in existence, the card will remain popular based on its rarity and unique look. With a tiny jersey piece and another sticker autograph, Limited follows a disappointing trend. Parallels include Silver (#/25) and Gold Spotlight (#/10). 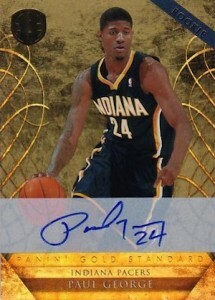 As the name indicates, the Paul George rookie card from Gold Standard features a lot of gold in the design. 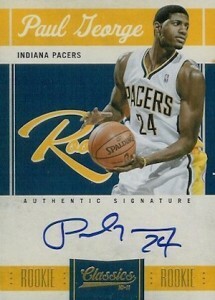 While the on-card autograph is a plus, Panini managed to still make it look like a sticker autograph. There is also a Platinum Gold parallel serial numbered #/25. 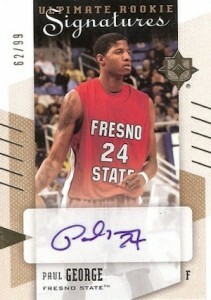 Paul George's Panini Stickers rookie card is exactly what you would expect it to be. A low-priced sticker with a simple design, these cards are great for young collectors. Panini Threads applies a unique spin to rookie cards featured in the product. Printed on a wood-like paper, the card showcases a half-court background. Unfortunately, the autographs are very susceptible to bleeding. 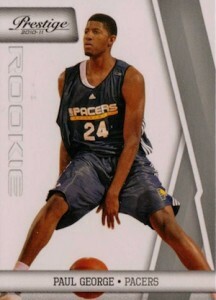 This Paul George rookie card is limited to 399. The first of several manufactured patch cards, Playoff Contenders had a base rookie card and short print variation card for each player. The variation card features a secondary logo patch for the team. Both versions are autographed and are not numbered. 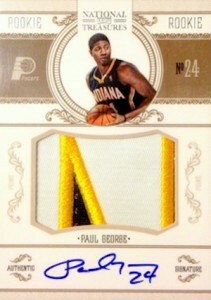 The top Paul George rookie card, National Treasures has emerged as the best replacement for Exquisite Basketball. Featuring a large jersey patch, on-card autograph and print run of only 99, these cards are already nearing the one thousand dollar mark. Gold parallels are limited to 25. 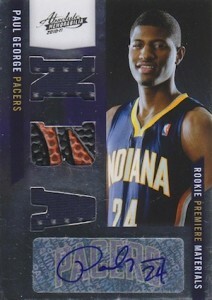 I am still not sure why Prestige includes mutiple rookie cards for each player. 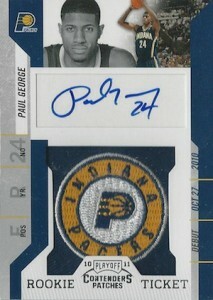 Between the two, the best choice is card #220, which shows Paul George in his full uniform. Both can be found for a few dollars. Parallels include Orange Bonus Shots (Retail, #/499), Gold Bonus Shots (#/249), Purple Bonus Shots (#/49), and Green Bonus Shots (#/25). Why? These are questions I ponder when I see cards like this. A tiny image of Paul George is squeezed into the corner to make way for a massive manufactured logo piece. Also, the signatures never seem to look crisp on these cards. A high print run further diminishes the value. 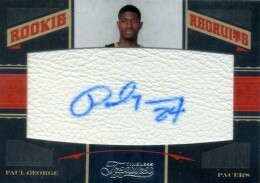 The Paul George rookie from Timeless Treasures is neither timeless, nor a treasure. Again, Panini squeezes a tiny image of George onto a card to make room for an oversized signature area. This could have been a good thing if the autograph was not signed on a feaux leather cut piece. What you are left with is a disappointing rookie card featuring a dis-colored autograph that is is prone to fading. In complete contrast to Timeless Treasures, you have Totally Certified. 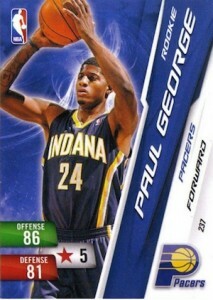 This is a nice looking Paul George rookie card. 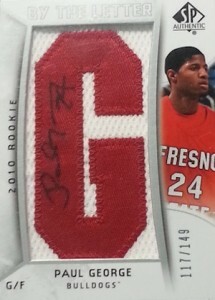 The modern design features a large jersey piece under a die-cut "Rookie" text and on-card autograph. The print run is still a little on the high side but there are several parallels which are more rare. These include Red (#/99), Blue (#49), Gold (#/25), Green (#/5), and Black (1/1). Because Panini has the exclusive card license with the NBA, Upper Deck is forced to use college images on SP Authentic. This is actually a nice change of pace. Like the Rookie and Stars card above, signatures rarely look good on the jersey letters. The print run is also somewhat misleading. Although the letter "G" in Paul George's name is limited to 149, the entire run totals 894. That is way too many cards. Ultimate is another product that has seen its relevance drop since Upper Deck lost its NBA licensing. The design teeters close to some kind of geometric shape art but it does not distract from the card. A low print run of 99 immediately boosts the appeal and value, but the sticker autograph is a huge letdown. 2014-2015 - 7 10 Paul George Select GOLD!!!! Below you will find an example of what Paul George's authentic signature looks like. This can be used as a first point of reference for determining the legitimacy of autograph memorabilia, but is not a substitute for having your items authenticated by a well respected professional autograph authentication company. Paul George - Rookie Jersey Auto Lot - 2010-11 Certified 599 99 49 !